“Fibromyalgia” is a disorder causing fatigue, sleep disorders, and aching muscles without detectable inflammation. Unlike in rheumatoid arthritis, fibromyalgia does not cause inflammation in the joints, muscles, or other tissues. But, fibromyalgia can cause severe pain and fatigue that interferes with daily activities. Fibromyalgia and climate changes can also cause sleep disorders. Other symptoms can include sense of stiffness, depression, autonomic imbalance, headache, irritable bowel syndrome, mild fever, dry eyes, impaired memory, inability to concentrate, and even restless legs syndrome. Accumulated stress may create pain and insomnia, and may include headaches and painful menstrual periods. However, fibromyalgia is not life-threatening. Fibromyalgia affects more women than men, and may occur at any age. Only 10 to 20% of people with fibromyalgia are men. Most doctors agree with fibromyalgia's 18 tender points as the general identifying location. According to modern medical technology, the patient must feel pain from at least 11 of these points by applying pressure to be considered as fibromyalgia. However, detection is limited to those who suffer from the disorder for more than 3 months. 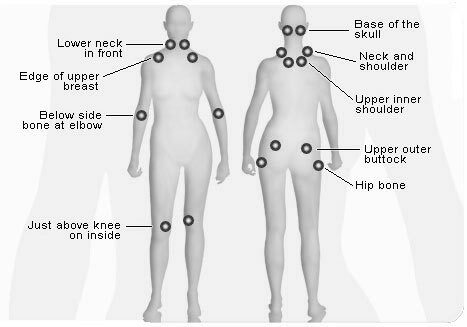 Doctors examine 18 tender points (9 symmetrical pairs) of the body to help diagnose fibromyalgia. Unfortunately, fibromyalgia cannot be detected by blood test, X-ray, CRP test, EMG (electromyogram) test, CT scan and MRI (magnetic resonance imaging). Is it not the reason that patients have wasted time and effort visiting several hospitals and clinics to find the cause of pain? It is very difficult to conclude the real cause of fibromyalgia, but our experiences and observations indicate that the majority of patients are affected by the negative energy. Other cases are due to accumulated stress and lifestyles, especially lack of exercise. There is still no silver bullet in medicine for treating fibromyalgia. Most are taken only as common pain relievers and as a symptom management. If you're suffering from fibromyalgia, you can try the PYRO-ENERGEN treatment for a week or two. Many PYRO-ENERGEN users were satisfied with the treatment. To those who did not benefit from the PYRO-ENERGEN treatment, we recommend you to take a rest from your works, change your lifestyle for more enjoyment, and of course, feet, and hand/finger exercises daily should be implemented. Then, good results will be observed. Some studies show that aerobic exercises, fitness, swimming, jogging, or walking, are beneficial for muscle development and reduction of pains.